Native American Symbols, like the Thunderbird symbol, can vary in meaning from one tribe to another and across the culture groups of North America. Discover facts and information about the meanings of secret and mysterious symbols used by Native American Indians in our List of Symbols including the Thunderbird symbol. Native American Indians were a deeply spiritual people and they communicated their history, thoughts, ideas and dreams from generation to generation through Symbols and Signs such as the Thunderbird symbol. 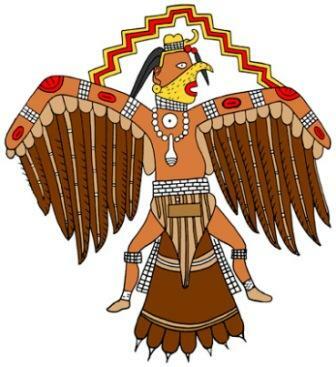 The origin of the Thunderbird symbol derives from the ancient Mississippian culture of the Mound Builders of North America and were major elements in the Southeastern Ceremonial Complex of American prehistory (S.E.C.C.). The enemy of the Thunderbird was the Underwater Panther, a sea monster from the Underworld. Native American symbols are geometric portrayals of celestial bodies, natural phenomena and animal designs and representations of actual events. The meaning of the Thunderbird symbol was viewed by some tribes as an omen of war when the sound of thunder was heard. The name of the Thunderbird name originates from the belief that the beating of its enormous wings causes thunder and stirs the wind. The Native Americans believed that the giant Thunderbird could shoot lightning from its eyes. 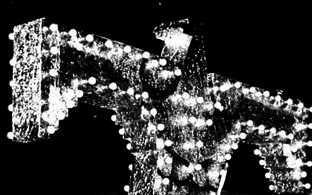 Thunder was believed to be a sign the spirits were at war in the skies but this also foretold of victory for tribal wars fought on the ground. For additional information refer to Mythical Creatures. 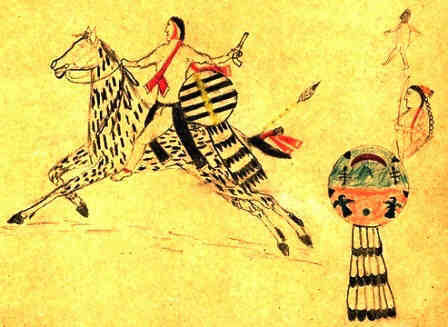 The Thunderbird symbol is depicted on the shield in this Arapahoe Ledger painting. Native American Indians of the Mississippian culture were sun worshipers and had a highly complex warfare culture. 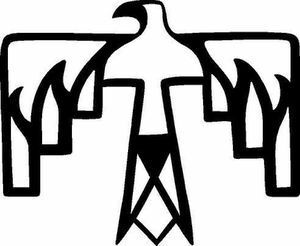 Their symbols, such as the Thunderbird symbol, reflect the warfare culture and the religious beliefs and cosmologies of the different historic tribes who existed at the time of the first European contact. The Mississippians believed that the universe consisted of three parts with good and bad spiritual forces. These three worlds were linked together and their connection was usually portrayed as a cedar tree or a striped pole. The Underworld was inhabited by spirit snakes, the Upper world was inhabited by spirit birds and the people of the earth who were ruled by these powerful spirits like the Thunderbird. Items displaying symbols, like the Thunderbird symbol, from the Mississippian culture have been found in burial sites that contained war axes, knives and other weapons. 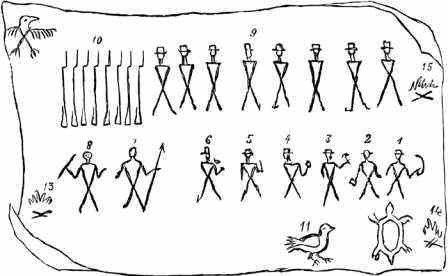 This type of symbol was embossed in valuable materials such as rare shells, copper and lead and depicted on pottery and stone tools and weapons. Thunderbird. Discover the vast selection of pictures which relate to the History of Native Americans and illustrate many symbols used by American Indians. The pictures show the clothing, war paint, weapons and decorations of various Native Indian tribes that can be used as a really useful educational history resource for kids and children of all ages. We have included pictures and videos to accompany the main topic of this section - Thunderbird. The videos enable fast access to the images, paintings and pictures together with information and many historical facts. All of the articles and pages can be accessed via the Native Indian Tribes Index - a great educational resource for kids.